It’s happened to us, some more frequent than others of course. We’ve dreaded it most when we’re running late for an appointment or something, but it seems as though we’re constantly misplacing our keys or iPhone – and the rush to look for either of them can be maddening! Well, if you find yourself in this kind of predicament quite often, then the Kensington Proximo is here to save you from all the hassle trying to track things down on your own. So what is the Kensington Proximo? Well, it’s essentially a Fob & Tag Kit that allows you to keep track of your belongings – such as your keys, wallet, bag, backpack, or whatever else you want to attach them to. In addition, it’s also used to help you sniff out your iPhone if you somehow forget where you last placed it. Honestly, there’s nothing much to the Fob and Tag kits, as the former looks like you average car alarm key, while the other is circular and attaches easily to a chain or strap. Seeing that rely on Bluetooth 4.0 connectivity, they’re efficient in the battery life department, seeing that they’re powered by CR2032 Lithium coin batteries, which are included with the purchase. In fact, they’re rated to provide up to 6 months of juice. Currently, the Proximo supports only the iPhone 4S and 5, with no word about other platforms. To effectively make use of the Kensington Proximo, the accompanying Proximo app enables us to connect and set up our kits. Once it’s up and running, we can visually see the connection status of each, and as we move further away with our iPhone from our Fob and Tag Kits, we’ll be alerted to high pitched tones on the Proximo units indicating we’re moving far away from them. Naturally, we can control the sensitivity so they’re not always going off, but even better, the Fob kits allows us to track down our iPhone too! All we need to do is press the button on the Fob kit, and as long as we’re within the general vicinity, it’ll send a notification to the iPhone – where it’ll emit a red alert/all hands on deck sound. From what we’re seeing, both units have a range of approximately 30 feet, but in the event they’re completely out of range, the app will remind us about the last known location on a map. Never again do you need to be late for an event because you can’t find your keys, wallet, or iPhone! 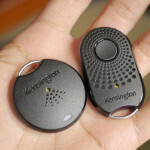 As long as you’re using the Kensington Proximo, you’re bound to track them down in a heartbeat! For pricing, you can purchase the Fob and Tag kits individually – $25 for the tag kit, $40 for the fob kit. However, you’ll only need to shell out $60 to pick up the Proximo kit, which includes the two units.